My absolute favorite part of this job is spending time with our Makers. I love listening to their stories, learning about innovations and thinking/brainstorming about where their products will sell best. 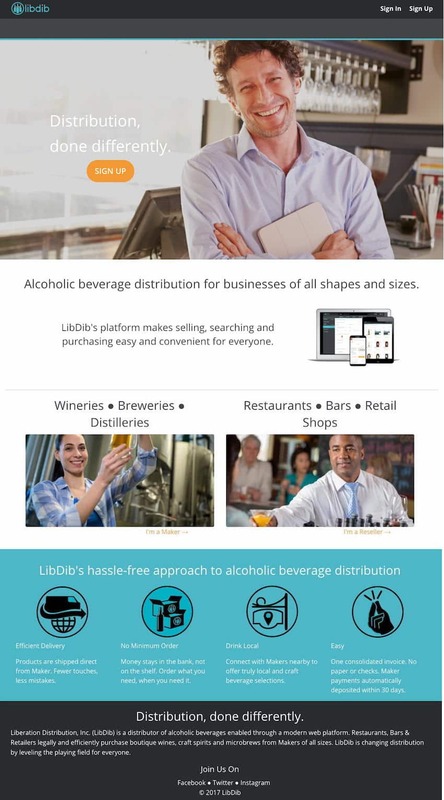 It’s interesting to me and I love getting any and all feedback from them on the LibDib distribution model and platform. Flo is brand new to the booze business and she is making something super cool–a (KLC) Kale, Cucumber and Lemon vodka. Ving Vodka is totally organic, hand-crafted, non-GMO, gluten-histamine-sulfite-sugar free and has a spectacular package. Flo is based in LA–she is a professional actor/dancer who evolved into a writer and director (and now has her own production company). Her brand probably has one of the coolest websites I have ever seen, and provides the all the right information, images and videos about her vodkas. Flo visited the LibDib offices right after our launch. She was just getting started and exuded pure passion. She was so excited to get her product to market. She had a ton of questions–and that’s truly what I love, trying to use my experience in the industry to help Makers. Ving has a great account base in LA and Flo communicates with them regularly. Buzzfeed did a viral video about histamines in alcohol, featuring her product and BOOM: she received tons of sales to consumers (through retailers) from all over the world. It’s been great getting her up and running on LibDib and we look forward to expanding into more markets with her KLC and Corn Ving Vodka. Jenny was one of our first Makers to join the LibDib platform with distribution in New York. She runs Rhine Hall Distillery in Chicago with her dad (I love this, coming from a family-owned winery myself). Rhine Hall makes the most amazing fruit (mango, apple and more) brandies. She’s been at this for awhile so from the get-go, her key questions and feedback really helped us continuously shape our platform, dashboards and tools. The LibDib Team had the opportunity to meet Jenny in the office last week when she was in California visiting some accounts. She has a great method to selling and we passed along some prospects including bottle shops, bars and restaurants that we thought would fall in love with her products. A few of us are heading to Chicago next week and we look forward to seeing the distillery in person and hopefully meeting Jenny’s partner/dad. Jenny has traditional distributors in many states. She visits the markets, makes the connections and does the work. Jenny already had some relationships in New York and has expanded those with the LibDib platform. She wants to ensure that these relationships remain hers and are not interfered with by a distributor who might push other priorities. That’s exactly what we are trying to build here at LibDib. Makers have the relationships with the buyers. Every Maker has equal footing on our platform (no matter how big or small), so any bottle sold is fine by us (i.e. no quotas, bonuses of favors). We will always encourage direct communications between buyer and seller. We are firm believers that there is no better salesperson than the Maker themselves. LibDib is here to be the enabler of the most passionate and effective sales force out there. This is kind of a hilarious story. About two months before LibDib launched in California, I received a letter from Meg. She is a winemaker up in Oregon and was getting ready to launch Nasty Woman Wines, a brand that she was inspired to start after the 2016 election. The letter was actually not about distribution. It was about the URL www.nastywomanwine.com. After the debate where Trump called Clinton a “Nasty Woman” I was yelling at the TV and then went immediately to Network Solutions and bought the domain. I ended up drinking a fair amount of wine that night for one reason on another….so I sort of forgot about it. But too funny, Meg and I had the exact same thought. She executed and frankly, I am kinda busy with this Internet start-up thing. So, I gave her the URL for a case of wine and offered to be her California and New York distributor. She is now up and running in both states (March 1 in NY). Her wines are great and she donates 20% of her net profits to help get more women to the table in policy and leadership. I am so looking forward to the day when I can get all three of these fascinating female Makers in one room together…..so we can talk, share stories and of course have a few drinks (a KLC Vodka Bloody Mary, a Cherry Brandy Lime Fizz and Boss Lady Bubbles please). *After 20 years in the booze biz, it is really exciting to see some of the efforts and progressions happening to diversify the workforce. I had the opportunity to attend a Women and the Vine & Spirits and WSWA Women’s Leadership conference this past summer. Both were really interesting and I loved meeting many of the talented and crazy smart women in this industry.